Level 3. You are used to climbing and descending on 40°-50° angle snow and ice slopes/couloirs , even on long stretches (100m. 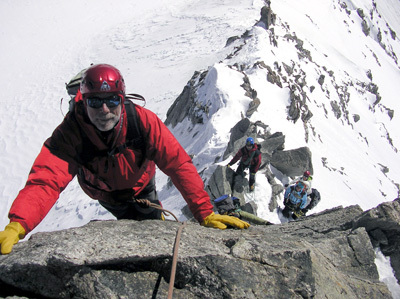 or more) and on mixed terrain (both ice and rock) and you can climb on rock, wearing crampons, up to advanced III°. In the high mountains you are at ease doing climbs of PD level with short sections of AD, also on exposed ridges. On rock face you are confident climbing at 4° degree as second of the team and you’re starting to manage some short 5° sections, even on routes of 200-250m. of altitude difference.